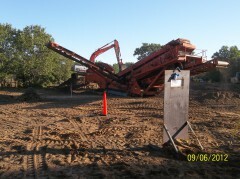 VRHabilis was awarded a SATOC IDIQ for UXO Clearance at the US Army Reserve Base at Fort McCoy, Wisconsin. This contract is for a Base year and 4 Option years, with a potential total value of $5 million. As an example of the type of work being performed, for one of the Task Orders VRH conducted a munitions response to remove Unexploded Ordnance (UXO) from a military training area. VRH used two separate, but complimenting techniques to clear a 26-acre parcel. A grid system, with 100 ft by 100 ft areas, was used for manageability and production tracking. This training area had many uses. It was part of a direct-fire impact area, a possible Explosive Ordnance Disposal (EOD) demolition area, and was currently being used as a Firing Point. This area contained many cultural debris objects, portions of firing wire, C-ration cans, Meals Ready To Eat (MRE) foil wrappers, tin cans, and more. These objects impede the ability, and slow down the production rate of UXO technicians locating munitions and Explosives of Concern (MEC). VRHabilis project engineers developed a plan to remove a 12 inch soil cap of the clearance area to remove this debris. This soil cap was removed using a D-6 bulldozer and an armored tracked excavator. The soil was fed into a Mobile Screen Plant, which separated the soil from the cultural and MEC debris. Once the soil cap was processed and all debris removed, the clean, sifted earth was staged while UXO technicians did a sub-surface “Mag and Dig” clearance to depth, using handheld magnetometers. Once this operation was done in the grid, the clean, sifted soil cap. was replaced and graded ready for the on base environmental team’s restoration efforts. The VRH team recovered 752 UXO items and approximately 26,000 pounds of ferrous and non-ferrous munitions and cultural debris in this 26 acre parcel, which was recycled. For other Task Orders, remote controlled brush hogs on skidsteers were used to first clear the vegetation to improve visibility prior to the manual detection and clearance of MEC.